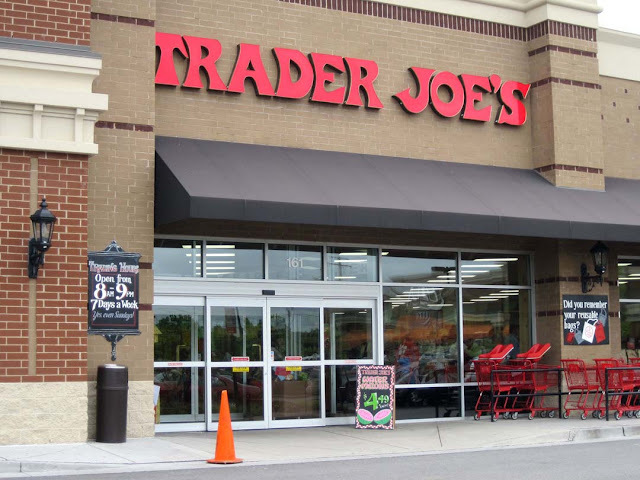 creative index is now union shore: what's good at trader joe's? I've never been there (they didn't have a location in Buffalo), but since moving to NC, I was excited to learn that there's a Trader Joe's just an hour away! I'm planning on venturing out there one of these days, but I wanted to know if it's worth all the hype? So I need your help! What do I need to cart home with me? Or should I not waste my time? I'm in California right now visiting my mom and I can't wait to check out Trader Joe's. I'm going to stock up on things because we don't have any in Canada. If I find anything interesting, I'll let you know. everything! Some of my favorite though are: chocolate covered pomegranate seeds, the chocolate covered frozen bananas... seeing a theme here? I just love Trader Joe's! Here are a few of my favorites: butternut squash soup (comes in a carton), their chicken salad, their vanilla yogurt with almond chips, from the frozen section their mushroom ravioli, orange chicken, sweet potato gnoochi, and veggie burgers (add salsa to 'em). Also love their apple breakfast bars (like a nutri grain bar only better), and they also make this flatbread thing in the frozen section with ham and carmelized onions. It's awesome! ooh my gosh, I could go on and on. I agree with Jenny who said you can't really do it for all your shopping, but you can do a lot. They have a great selection of premade salads and wraps - the chicken pesto wrap is super good. We also get their champagne vinegrette, chocolate and seasalt covered almonds, frozen veggie gyoza dumplings. Their frozen french onion soup is pretty decent for a quick french onion fix. Enjoy! I can't wait to hear about it! Oh gosh...we do almost all our shopping at TJ's! Here's our weekly buys, lots of great prices for snacky stuff. Trader Joes is the best!! Everything is good there! I love their hummus selection --so yummy! 10. Wasabi Flavored Seaweed or Wasabi Peas. Am I helpful or what??? And did you change your blog again? Looks more springy.. Or am I imagining things... Hope you are well! Anyways, I am trying to click your contact link and for some reason it directs me right back to your page. I happen to stumble to habibi's blog and found the blog really beautiful, so i checked who made it and it led me to you. I'm wondering if you still do blog templates? I love Trader Joe's. We have one about 10 minutes from us and I shop there almost weekly. There dry roasted unsalted almonds are the BEST. Love their produce...and you can get a lot of it (organic) without breaking the bank. We buy Joe's O's cereal there (like Cheerios) for my toddler. Olive Oil, soups, pasta, ummm...what else? Bar soap for the shower - I think it's almond something...Oh, and how could I forget dark chocolate?! Oh, and BASIL! haha...sorry...I keep thinking of things. There is lots more. Plus they have a beautiful selection of fresh cut and potted flowers.